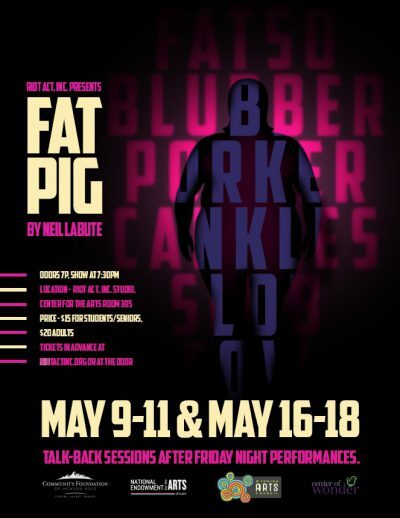 Fat Pig by Neil LaBute – Riot Act, Inc.
Riot Act Inc.’s third full-length production of our 16th season is Fat Pig by Neil LaBute, running May 9-11 & 16-18 at Riot Act, Inc.’s Studio, room 305 at Center for the Arts. This serio-comedic play pushes buttons at the center of our own insecurities. Join us after the Friday night performances for talk-back sessions with the cast, crew, and experts on the themes of the play including body image. Helmed by director Henry Raynor Williams, stage manager Delia Compton, the show boasts a wonderful cast including Karissa Dabel, Patrick Nolan, Graham Koten, and Annessa Melnick. Tickets are available in advance online at www.riotactinc.org or at the door and cost $25 for adults or $20 for students/seniors. Riot Act, Inc. T-shirts, Riot Act, Inc. Stickers and Concessions will be available at the concession stand before each performance and during intermission.